If you follow me on Instagram, you’ve probably noticed that I’ve spent the last week canning and preserving up a storm! 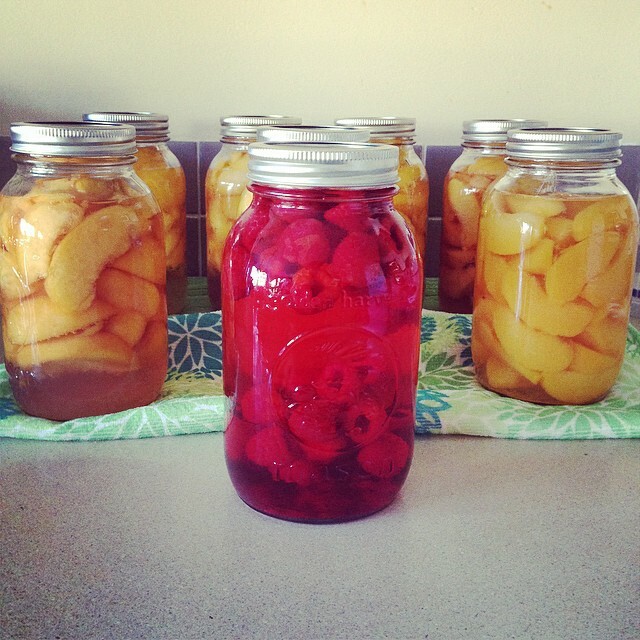 I took a food preservation class last weekend and I can’t believe all the great tips and tricks that I picked up. I have a ton of foodie friends and family members on my Christmas list. I know that it’s CRAZY to be thinking of Christmas already, but I have a bit of time right now, I know that the fall is going to be busy for me and right now is the best time to be buying fresh, local produce. I’ll be sharing a couple of canning recipes next week but I thought that I would share a recipe today that is super easy, takes absolutely no special equipment and can be done in minutes. It’s my super simple Raspberry Vinegar recipe and I currently have 7 liters of it “brewing” on my countertop. Place 1 cup of raspberries (You don’t have to measure. Just grab a couple of handfuls) in a glass jar. 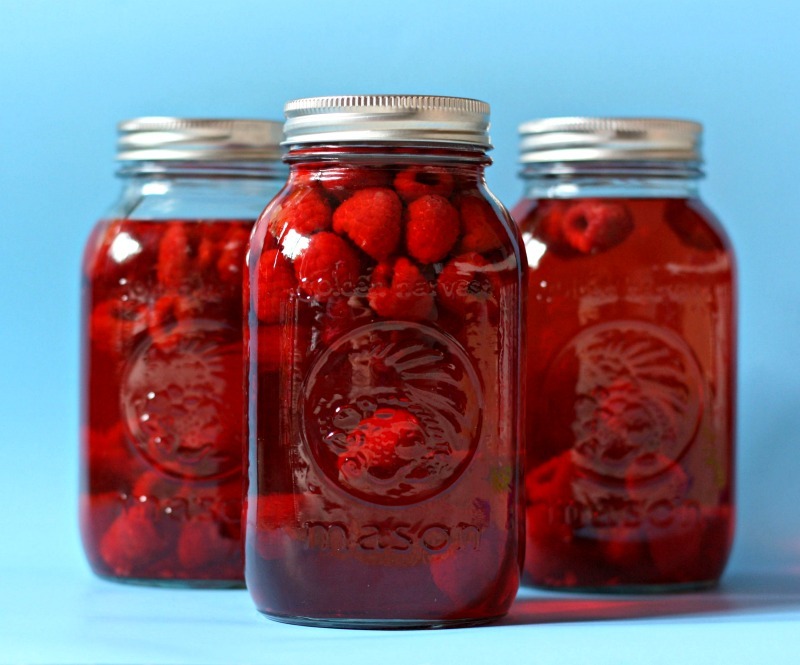 Pour vinegar in jar over raspberries. Cover glass jar and let sit for 3 weeks. After 3 weeks, strain vinegar to remove raspberries. Put in pretty decorative bottles to give as gifts or store in a glass jar and use yourself! 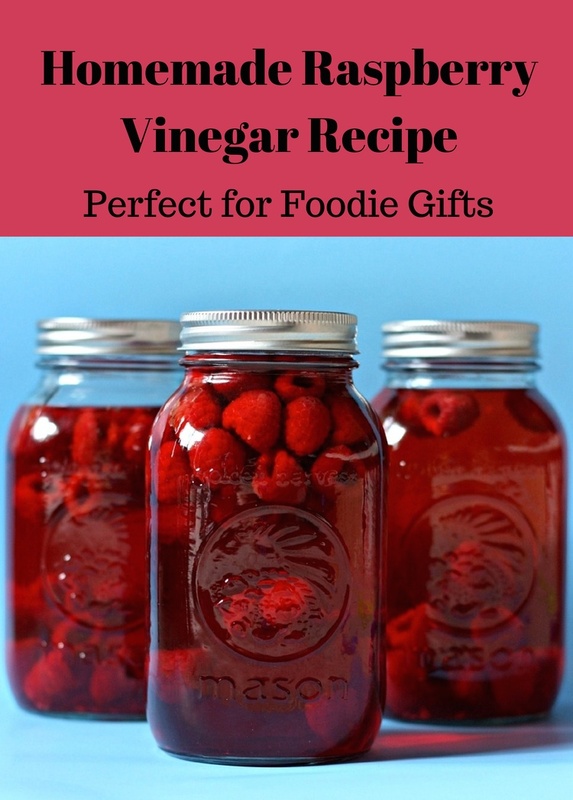 Raspberry vinegar is delicious and can be used in all kinds of recipes to add a raspberry flavor or simply add a bit of olive oil to make a raspberry vinegarette! I just started brewing my raspberry vinegar this week so don’t have finished pictures in pretty bottles yet, but wanted to make sure that I shared this recipe with you while raspberries are still available so that you can make your own raspberry vinegar for Christmas gifts! Tell me… Do you give handmade Christmas gifts? What are some of your go to favorites? Want even more DIY Gift ideas? Check out these Homegrown & Healthy 12 Days of DIY Christmas ideas! Your raspberries look beautiful and delicious! I have done this with strawberries also. Thanks for sharing at the Linky Party #10. That sounds so good! What a great idea. I never would have thought of something like this. BEAUTIFUL color too! Pinned it.